Thread: How would you do it? Keep in mind, these are temporary setups till my enclosure comes. So how would you set this up if this is what you had (for right now) ? And one more - sorry about the blurr.. I guess one more idea would be to move the small half log to the floor area but I was tryin to give her some room to move around. They seem to take advantage of however I put things anyways.. The silence is deafening, Hopefully you guys arent face palming me over there lol! @Elizabeth Freer what do you think? Sorry I’m not much help. I have no experience with small housing. Last edited by Sg612; 02-21-2019 at 02:05 PM. 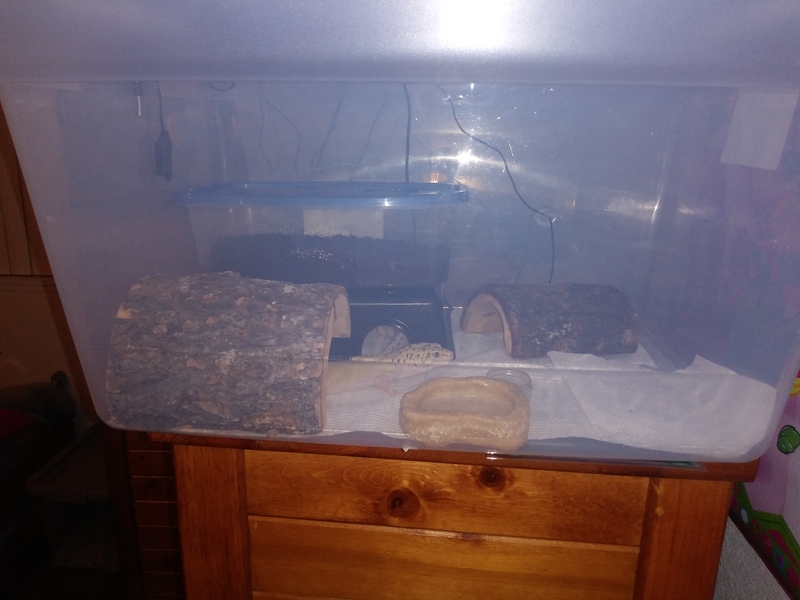 They are all housed seperately, in that pic i had introduced my male to one of the females to get some kind of idea of his temperment which he seems to be mild mannered and once his tank was done bein upgraded i put him back in his own (was making his foam house/hide). Im just curious on how i should lay it all out in the tub for now. It may maybe just personel preference for us humans as the geckos seem to use it all either way i put it. I've never bred leopard geckos. Aliza usually checks in in the evenings. In the past GU was much more active than it is now. I’m thinking the last pic so that they have at least a small area of walking space left. Well these setups arent so much for breeding as temporary housing, i try to put my self in the geckos shoes and hope they enjoy what im doing for them. I realize with the moist hide its basically what breeders use for them to lay eggs but ive noticed since ive started doing it their sheds have gotten alot easier. Last edited by Geopard Lecko; 02-21-2019 at 02:17 PM. Cool that is how it is right now, atleast that one. And when it comes to leo advice Facebook is generally a pretty scary thing much of the time. i only just made a facebook, i realized that if im going to get into this it had to happen. as i mentioned in my other post sometimes i have to read things more then once for it to sink in, and even then i'll cross reference it. cars have been my hobby for the past 12 years or so and i consider my self an expert on my car, i've had it torn completely down multiple times and built engines and transmissions and yeah, so what im sayin is when i get into something i really get INTO it!